For other uses, see Brother and Sister (disambiguation). 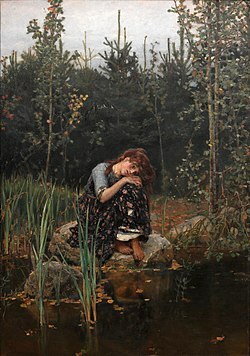 Sister Alenushka Weeping about Brother Ivanushka (painting by Viktor Vasnetsov, 1881), Russian variant collected by Alexander Afanasyev in Narodnye russkie skazki. "Brother and Sister" is a well-known European fairy tale which was, among others, written down by the Brothers Grimm in their collection of Children's and Household Tales (Grimm's Fairy Tales). It is alternatively known as "Little Sister and Little Brother" or (in the Grimm's version) "Brüderchen und Schwesterchen". Tired of the cruel mistreatment they endure from their wicked stepmother, who is also a witch, a brother and sister run away from home, wander off into the countryside, and spend the night in the woods. By morning, the boy is thirsty, so the children go looking for a spring of clear water. However, their stepmother has already discovered their escape and has bewitched all the springs in the forest. The boy is about to drink from one, when his sister hears how its rushing sound says "Whoever drinks from me will become a tiger". Desperately, the girl begs her brother not to drink from the spring, lest he transform into a tiger and tear her to pieces. So they continue on their way, but when they come to the second spring, the girl hears it say, "Whoever drinks from me will become a wolf". Again, she desperately tries to prevent her brother from drinking from it. Reluctantly, he eventually agrees to her pleas but insists he drink from the next spring they encounter. And so they arrive at the third spring, and the girl overhears the rushing water cry, "Whoever drinks from me will become a deer". But it is too late, because her brother has already drunk from it, and changes into a deer. As the initial feeling of despair clears up, the children decide to live in the woods forever. The girl takes care of her brother, and ties her gold chain around his neck. They go to live in a little house deep within the woods and live there happily for some years, until they are disturbed one day by a hunting party and the king himself who has followed the strange deer home. Upon seeing the beautiful girl, he immediately asks her to marry him and she accepts. Thus she became queen and they all live happily in the king's castle. Time passes and the queen gives birth to a son. Their stepmother, however, soon discovers that they are still alive, and plots against them. One night, she kills the queen and replaces her with her own disfigured daughter, whom she has transformed to resemble her. When the queen's ghost secretly visits her baby's bedside for three consecutive nights, the king catches on and her stepmother's evil plan is exposed. The queen comes back to life when the king embraces her, and her stepfamily are tried for their crimes. The daughter is banished into the woods and torn to pieces by wild animals, and the stepmother is burned at the stake. At the exact moment of her death, the deer becomes human again, and at long last the family is reunited, where they lived happily ever after. The first recorded appearance of Brother and Sister is in Giambattista Basile's Pentamerone around the 17th century. It was written down as the tale of Ninnillo and Nennella. Since then it has circulated in a number of European countries under varying titles but with most of the main story intact. In Russia the story was more commonly known as Sister Alionushka, Brother Ivanushka, and collected by Alexander Afanasyev in his Narodnye russkie skazki. In the Aarne–Thompson classification system of fairy tales, Brother and Sister is categorized as its own type as number 450, the brother and sister. Another of this type is The Lambkin and the Little Fish. At times, Brother and Sister has been confused with Hansel and Gretel, which has also been known under the alternate title of Little Brother and Little Sister. The Grimms selected Hansel and Gretel for the tale by that name and kept the Brother and Sister title for this tale. Some publications of the Hansel and Gretel tale still use the Little Brother and Little Sister title, causing confusion for readers. The story as told by the Grimms was first published in the original 1812 edition of their Children's and Household Tales, and subsequently featured in all later editions, with several additions in 1819. This tale, like The Twelve Brothers, The Seven Ravens, and The Six Swans, features a woman rescuing her brother. In the era and region in which it was collected, many men were drafted by kings for soldiers, to be sent as mercenaries. As a consequence, many men made their daughter their heirs; however, they also exerted more control over them and their marriages as a consequence. The stories have been interpreted as a wish by women for the return of their brothers, freeing them from this control. However, the issues of when the stories were collected are unclear, and stories of this type have been found in many other cultures, where this issue can not have inspired them. Modern psycho-analysis interprets the relation between brother and sister in this story as a metaphor for the animalistic and spiritual duality in humans. The brother represents the instinctive and the sister the rational side. As Brother and Sister opens, the two children are still in their youth and clearly in conflict over each other's choices. The brother cannot control his impulse to drink from the wellspring and is subsequently "punished" by being turned into a deer. Note then the symbolical gesture with which the girl ties her gold chain around her brother's neck, as if to suggest the taming of the animalistic side. Following is a period of relative happiness in which the two sides live in harmony with each other. In this context, Brother and Sister could be viewed as a veiled coming of age tale. In this story the animalistic side is associated with the male and the spiritual/rational side with the female. It has also been interpreted for messages about family fidelity through adversity and separation. Nippon Animation Company of Japan featured the story in one episode of season two of its anime television series, Grimm's Fairy Tale Classics. The siblings are given names other than their "titles": Rudolph for the Brother, Rosa for the Sister. Rosa is not murdered by the Witch, but instead is abducted and forcibly taken into a mountain. She uses some sort of bilocation to send out her soul and feed her baby, but it weakens her greatly in the process; her husband the King and his soldiers rescue her right before she withers away. The evil stepsister is omitted from the story, and the Witch dies offscreen rather than being burned at the stake. Contemporary literary works that draw upon this fairy tale and its analytical themes include "In the Night Country," a story by Ellen Steiber, "Brother and Sister," a poem by Terri Windling, and "Sister and Brother," a poem by Barth Anderson. Brother and Sister at SurLaLune Fairy Tales – Annotated version of the fairy tale. This page was last edited on 18 March 2019, at 00:56 (UTC).